Simple Failover continuously monitors your network servers, notifies you of any trouble, and redirects traffic to standby servers when needed. Monitoring is done by polling (sending requests to) your servers at configurable intervals and evaluating the response against configurable criteria (e.g., web page must contain specific text). It can monitor web servers, mail servers, FTP servers, DNS servers and practically all other TCP/IP based server types, as well as custom monitoring through script / command line execution. It logs monitoring results to a database for tracking and evidence. Notification (optional) is sent whenever a server is not responding as expected (after a configurable number of retries). Simple Failover can send notifications to multiple recipients via e-mail, a HTTP GET/POST/PUT request, through script / command line execution, and the Windows event log. Redirection (optional) of server traffic is done via DNS by always pointing your domain name to the IP address of a functional server. 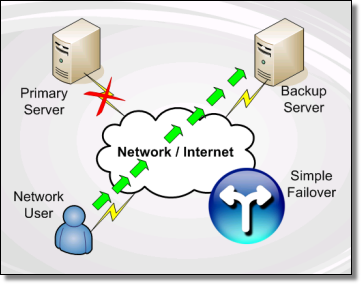 When needed, Simple Failover can either dynamically update the DNS records on your DNS servers (various methods), or it can itself serve as a front-end DNS server - forwarding any DNS requests that it cannot answer directly (other domain names, non-host-record requests) to a DNS server that you specify. When using the option to serve as a front-end DNS server (see Redirection above), Simple Failover can also provide weighted DNS round robin / load balancing. 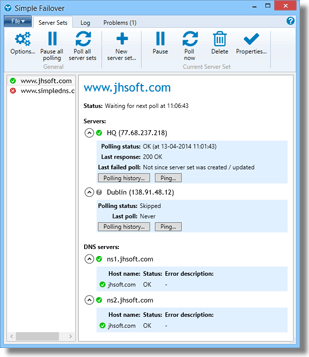 Simple Failover is a software package installed on your Windows computer - physical or virtual – local or cloud. You can configure everything and interact with it through an easy to use classic Windows desktop application user interface - no funky configuration files and scripts to figure out. Unless you really want to. In that case it also has an HTTP API (REST / JSON) making it possible to do everything without the GUI and to integrate it with almost anything. Simple Failover can be configured in many different ways depending on the level of monitoring and redundancy required. It can monitor any number of servers for a service, notify any number of recipients of problems, and update any number of DNS servers (or serve DNS requests directly) with any number of DNS host names for a service.